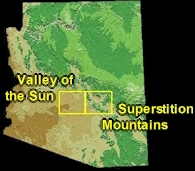 ﻿ geoPHOENIX - geography, geology, geoscenery, resorts, and points of interest in the Phoenix and Scottsdale metro area. FREE -- inside geoPHOENIX -- over 120 scenic views around Phoenix, Scottsdale, Tempe, and other cities in the Valley of the Sun -- send them to your friends as E-Postcards! Phoenix and Scottsdale, and the famous Superstition Mountains. Everything in geoPhoenix is FREE. CLICK ON A YELLOW SQUARE! GeoPhoenix is popular around the World! The map at left shows the locations of the last 100 or so visitors to geoPhoenix. You can click on each small dot to find out more about the specific visitor. Naturally, most of our traffic comes from the Phoenix, Scottsdale, and other cities in the Valley of the Sun. GeoPhoenix (R) can be contacted at info@geophoenix.com. We are always on Mountain Standard Time (=UTC-07). Mailing address: PO Box 2834, Scottsdale, AZ 85252 USA. Unless otherwise noted, all text, images, and designs within this site are © 1995 - 2017 by Richard Allen. All rights reserved. GeoPhoenix is a Registered Trademark. 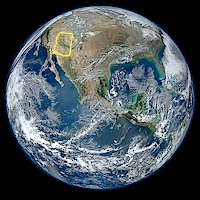 Image of Earth above courtesy of NASA.